On historic Beale Street in Memphis, birthplace of the blues, Moziah Bridges, also known as Mo, makes a sales call. 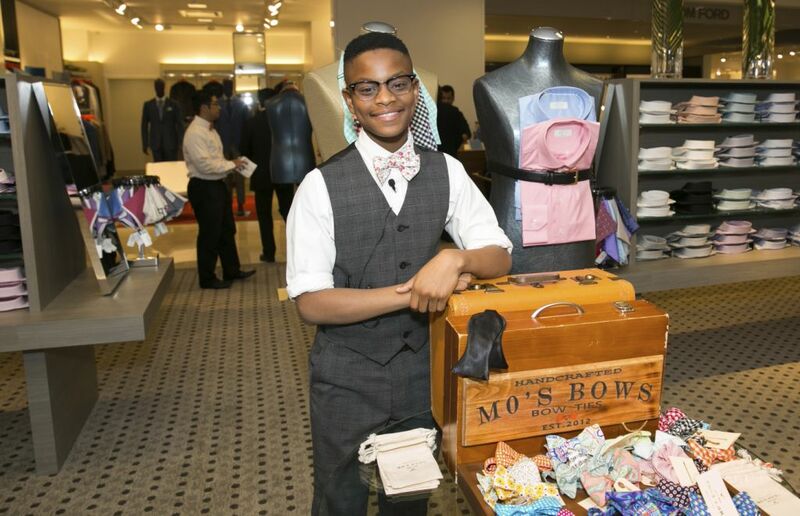 Dressed to the nines, with his signature briefcase in hand, this teenaged talent has arrived to showcase the latest designs from Mo’s Bows — his highly successful bow tie company. The NBA recently entered a sponsorship deal with the 15-year-old entrepreneur, giving his company the right to use NBA logos on its custom-designed bow ties, reports CBS News correspondent David Begnaud. It’s a funny story for Tramica Morris, Mo’s business manager — and mom. “I’d say, ‘Mo, go and get dressed,’ and he would come completely dressed in a suit and tie. And in my mind, it was his church clothes and it didn’t make sense, but in the last minute it was just, like, ‘all right, fine, let’s go,'” Morris said. Mo’s Bows began when, at 9 years old, the budding fashion designer wanted to make his own bow ties. In terms of training, he didn’t have to go very far. “I had my grandmom, and she helped me sew, and she helped me sew my first bow tie. And I’m so thankful,” Mo said. The company started to catch on after an appearance on “Shark Tank,” the reality show that makes or breaks new businesses. “Who drives who here?” Begnaud asked the young entrepreneur and his mom. “We drive each other,” Mo said. “I’m pretty sure like every week we’re like, ‘Ugh, I’m ready to give up,'” Mo said. “Oh yeah, we quit all the time,” Morris joked. In just six years, the company has surged in popularity. Mo’s keen business sense even earned him a trip to the White House. “He’s very courageous, he’s very confident, sometimes when there’s a thin line between confident and cocky and we have to shake him by the bow tie to make sure he understands the importance of it,” Morris said. This year, Mo signed a seven-figure deal to supply bow ties to every team in the NBA, but at 5-foot-10 inches the game being played at this house is how to keep him fashionably dressed. “She doesn’t want to spend a lot of money of these really nice shoes that I’m going to grow out of tomorrow,” Mo said. “He’s always had expensive taste,” Morris said. With all its success, Mo’s Bows remains a part of the community, giving money to local charities and taking care of customers who often drop by his house unannounced. Morris is a single mom, running a business that’s booming. “It feels really good. What’s even more important to me is that he’s defying the odds of what a fashion designer looks like. He’s been in Nieman Marcus and in Bloomingdale’s with all these designers who are older white men. Mo, a young African-American man from Memphis, Tennessee, is doing amazing things at 15 years old,” Morris said. While Mo’s Bows may bear his name, mom is always just a bow tie’s length away. Next articleShould Teenage Girls Lift Weights?